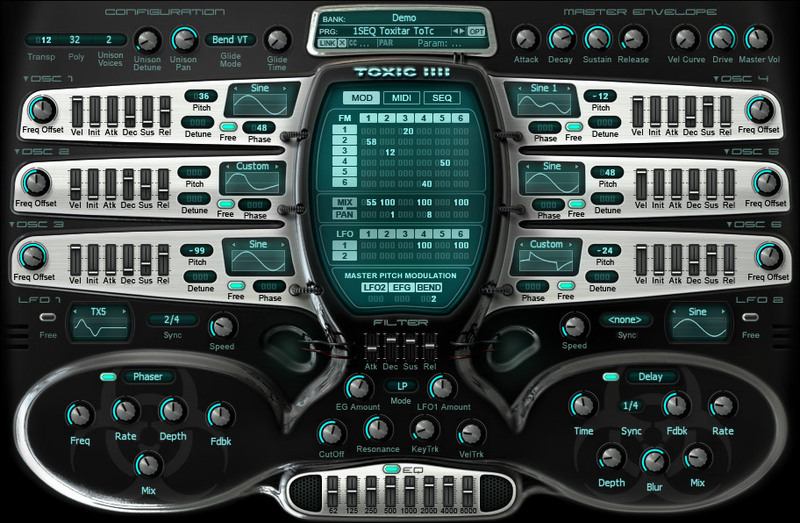 Toxic Biohazard by Image Line is a Virtual Instrument Audio Plugin. It functions as a VST Plugin and an Audio Units Plugin. Toxic Biohazard features a hybrid synthesis engine, combining the best of FM and Subtractive synthesis. With the addition of a warm, analog-modeled filter and set of built-in effects, the Toxic concept remains one of convenience, simplicity, and superb sound quality. One of the 'warmest', crisp, and clear Frequency Modulation engines in the world, owes its sound to the precise calculation of the digital signal. Due to high-resolution DSP processing, it produces sound with an extremely low noise threshold; something that most FM engines cannot offer. The Toxic Biohazard sound was built from the ground up, via Image Line's unique mathematical calculations and analog-modeling techniques. Completely alias-free, and well tuned for all sampling rates, they produce a rich, "fat" sound all across the spectrum. Due to the high quality of the anti-aliasing process, users will not encounter the shredding noise on high frequencies that has plagued some FM synthesis implementations in the past. Furthermore, the oscillators are calculated at extremely high speeds, keeping your CPU usage to a minimum. Toxic's low CPU consumption affords the user plenty of room for external processing and running multiple instances. The oscillators also come equipped with Maxx Claster's own powerful spectrum analysis technology. This allows the user to create his or her own waveforms, via the simple process of loading a WAV or AIFF format sound file. All of these features make the oscillators very flexible, and allow for the use of both synthetic and acoustic waveforms within Toxic III. Each oscillator also comes with 32 built in 'classic' waveforms, each shown to be the most useful in FM synthesis. Made to assure high quality and flexibility is built into the synthesizer its self, Toxic Biohazard aims to reduce the need for external processing altogether. The effect modules are designed to give the user access to several types of effects, from aggressive, tube-like distortion, to warm stereo delay, reverb, flanger, and phaser effects. With Image Line's tape delay emulation, based on non-fixed delay buffer sizes, instead of the usual methods incorporated within digital delays, the delay lines give you warm sound, with "true" feedback and modulation. Lastly, the signal chain features an analog-modeled, parametric equalizer to further shape your sound. The EQ provides access to crisp, clear high-end definition, creamy mid ranges and earth-shaking low-end frequencies. The Toxic Biohazard effect modules expands its palette of sound to include everything from dark, atmospheric textures to razor sharp leads, fit to slice easily through any mix. Maxx Claster's own analog-modeled, multi-mode filter is reminiscent of a certain silver box of old. Garnishing a warm, resonant Low-Pass mode, a smooth Band-Pass setting, and a creamy High-Pass mode, Toxic Biohazard gives a wealth of control over tone. The filter is further enhanced by modulation via a dedicated envelope generator and low frequency oscillator, as well as responding to velocity information and keyboard tracking. These features allow for extreme sound shaping, as well as subtle nuances attributed to dynamic playing. Powerful, yet simple, the sequencer offers a total of 64 steps, which can be divided into two independent, 32 step modules to allow double-polyphonic patterns. Using Image Line's "Smart Sequencer" technology, when a chord is played, the module defines that chord, and tunes the pattern accordingly. The sequencer also allows for pure playback of the programmed sequence from single notes. Simply holding one chord can virtually create an arrangement for you. The thing that gets me is...well to be true thinking of it, there are so many things that get me here: Sound, ease of use and sound design, the interface, and again the sound as that is the thing worth every penny of the price and the thing making it stand out. Perhaps it´s because it´s as IL writes FM/Subtractive hybrid, maybe because of the new engine, anyway it´s crystal clean, the basses are just wonderful and I enjoy it most of all as a source of gritty-hard-electronic sounds which are able to cut your .... off! I´d have to give it at least 11 here! As for the GUI, it´s one of the best and it fits the synth. That´s 10 as the black/green/silver combination is hypnotizing. Feature wise, it´s 6 operator synth with the classical FM matrix, there is also nice feature as you can import your wave samples in it, effects are great too - I add almost every time the Phaser and EQ to get really biting sound out of it, and the sequencer is quick to program too. I won´t name everything Toxic offers as you can find that in the info and there is no need to rewrite it again. Anyway I´d give it 10 here, not because it has all the functions that it could have, but because it has all that I ever needed to make all the sounds I was after and I just never felt missing something. The presets are great too, ToTc has done a great job as most of the sounds should be usefull to users that are not used to design their own and there are many of them too. I think over 500 of them. Anyway it´s really easy to make your own sounds or just to edit the other patches. ToTc deserves full points here! As for the stability, never failed and I think never will. Some Image-Line plugins have problems with the GUIs in some hosts like Sonar, Reaper, Savihost, but Toxic is thanks god not one of them. I think they have this problem with VSTs that have windows with envelopes etc. like Ogun, Sytrus, Edison...so 10 again! About the customer service - I promised myself that from now on company not allowing license transfers won´t get more then 5 points from me, because this is really important for me now as I would like to be able to trade plugin if I don´t like it. So IL will get only 5 points here as they are one of the companies and I take this as bad customer support. Änd I think it´s bad for the companies too as I would have bought more from them, but because of this I didn´t and started buying from companies that are more friendly here. Very good synth, absolutely worth adding to your stable. Toxic Biohazard is absolutely perfect out of the box for dance, ambient, house and trance tracks. It stretches nicely to suit other styles, and is very easy to program and experiment with. Since I moved to Mac/Live, I've been missing a strong FM sound in my palette. Toxic was a breath of fresh air. I had played around with Toxic II and III, and when I finally mulled it over and was ready to buy, this plugin had taken its place. I was put off at first, because the presets I'd fell in love with on Toxic III seemed mostly absent. I found a forum post saying that the older presets were compatible with Toxic Biohazard, so I gave in and got it (and yes, the presets from the older version worked perfectly). Also, there are a ton of presets you get when you buy which aren't in the demo. I had a little trouble downloading the preset packs, but I got quick and excellent support from the forums and also from the developer. Good show there. The sound is crisp and clean in the mid to high end, and is capable of some nice warmth on the low end. Some of the sounds are extremely rich and often stunning. For all its sonic power, it sits nicely in the mix. Another area it stands out is the pattern sequencer. It's easy to setup, has 64 steps, and you can copy your pattern to other patches (handy). The import doesn't seem to work with random midi files, and I wish it did. But I can see there would be some big technical snags with that, so I'm not sweating it. The AU version seems to suffer from some minor issues with Live 6, and the developer responded immediately that they're looking into it. I switched to the VST, and have had zero problems. Again, good support there. Well first off, I'd bought Toxic III on sale for $49 a while back, and I loved it to bits. Great for leads, basses, PADS (the best synth I've come across yet! ), atmospheres, you name it. Whatever you want, it does it! That's great Flex, what about Biohazard? Well, it does it even better than its ancestor. Has about a million (ok not that many) more presets than III, and all of them are extremely usable. All I have to do is load up a preset, tweak its filters or something just a bit, and voila! Instant awesomeness. The sound is lovely. One of the weak points of Toxic III was that its bass was just not quite there sometimes. In Biohazard, this has turned into one of its strong points! It truly is a workhorse synth, capable of any sound you want. Oh and the eternal question..."does it sound like a Virus?" Yes, actually, there's an excellent preset by ToTc Productions that really does sound like a Virus. In my not-super-educated opinion anyway. Oh and did I mention the GUI? Toxic III was a GREAT introduction to FM synthesis for me, being one of my first synths ever anyways. Toxic Biohazard is actually even easier to use, in my opinion. Now I know how, exactly, FM Synthesis works and it's made life so much easier when working with other FM synths. Oh, and the addition of the native FL Studio version is a kicker--it allows me to do all the fancy sliding and event editing I want! Stability has never been a problem, Toxic is a rock-solid synth in my VSTi and FLi versions. Documentation? Honestly I haven't looked at it ever, I haven't needed to! I haven't used customer support, but the fact that I got Biohazard as a free upgrade to Toxic III speaks volumes for Image-Line.